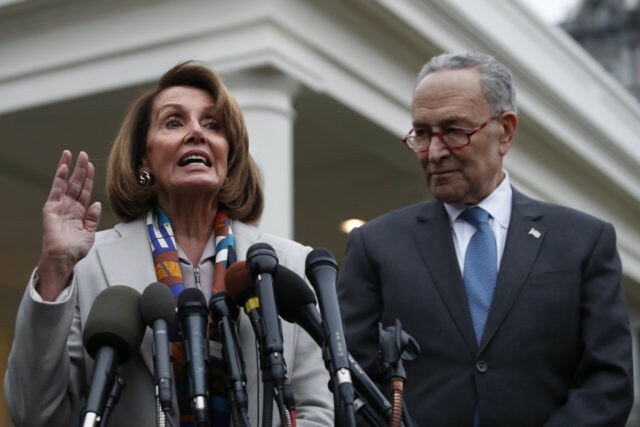 President Donald Trump mocked Senate Minority Leader Chuck Schumer for his deference to Speaker Nancy Pelosi during the shutdown negotiations. Trump commented on the ongoing gridlock as the partial government shutdown continued in its 33rd day. The president expressed disappointment that Democrats refused to engage in a compromise conversation to reopen the government and to fund physical barriers on the Southern border. Trump met with conservative leaders to talk about ways to end the government shutdown, but he did not publicly address reports that he was prepared to offer green cards to DACA recipients in exchange for wall funding. Department of Homeland Security Secretary Kirstjen Nielsen also attended the meeting, as well as advisers Jared Kushner and Stephen Miller.